LOCAL Brighton girl Anne Smith, who is providing support for her own carer, Colleen Morgan is aspiring to do great things in new-found love, ice skating. Brighton’s Anne Smith shows some of her winning medals to member for Lyons David Llewellyn. “I am a young Tasmanian figure skater in which I have a lot of passion for the sport of ice skating. Some time ago I watched a movie called Ice Princess and was inspired to try ice-skating. My carer, Colleen Morgan took me to the Glenorchy ice skating rink for a public session skate where I loved it from the very first time I tried it. After two years of hard training on ice and off the ice, I am now currently skating at the free skate level two ranking and working even harder to strive for a higher status. Anne puts her success down to hard work on the ice and off the ice. Her training schedule is 18 hours a week: on ice with her head coach Oxana Anichkina, second coach Joanna May and also off the ice doing ballet, strength and conditioning training and acro-stretch. “Recently I competed in two figure skating competitions: Tasmanian Figure Skating Championship 2014, Hobart, Tasmania and the Winter Sun Trophy 2014, Brisbane, Queensland,” Anne said. 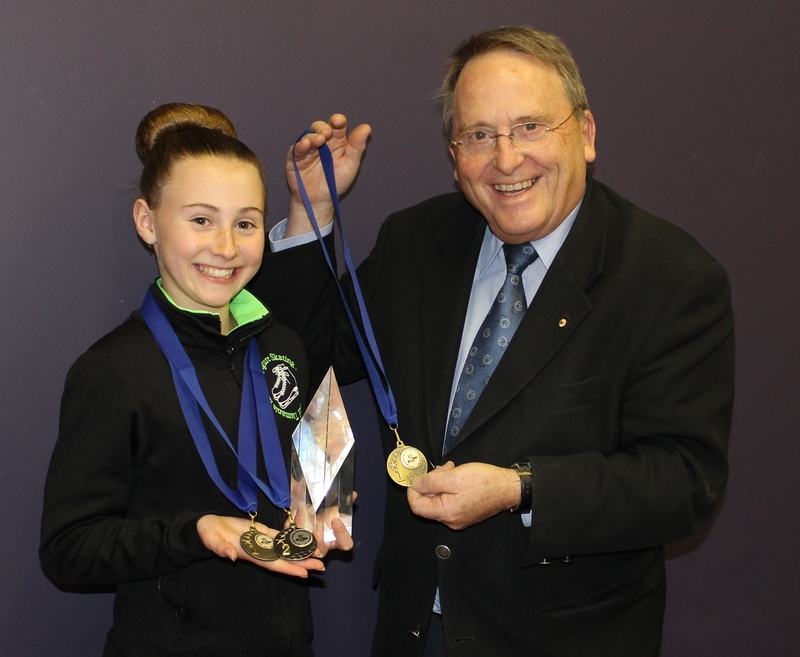 “I am delighted that I achieved two firsts and one second in the Tasmanian State Championship 2014 in June. “I was thrilled that I received first place in Winter Sun after competing against six others interstate skaters. That was my first competition in Queensland,” she said. As it’s the middle of the figure skating season, there are more competitions for me to compete in, in, which I am very, excited about. “Next would be the Crystal Challenge Cup 2014 which will be held in Melbourne, in September. Brighton Community News wishes Anne all the best in her endeavours. She is a delightful young woman who is not only a wonderful help to her own carer Colleen, but is also attempting to realise her ice skating dream and is working hard to that end. 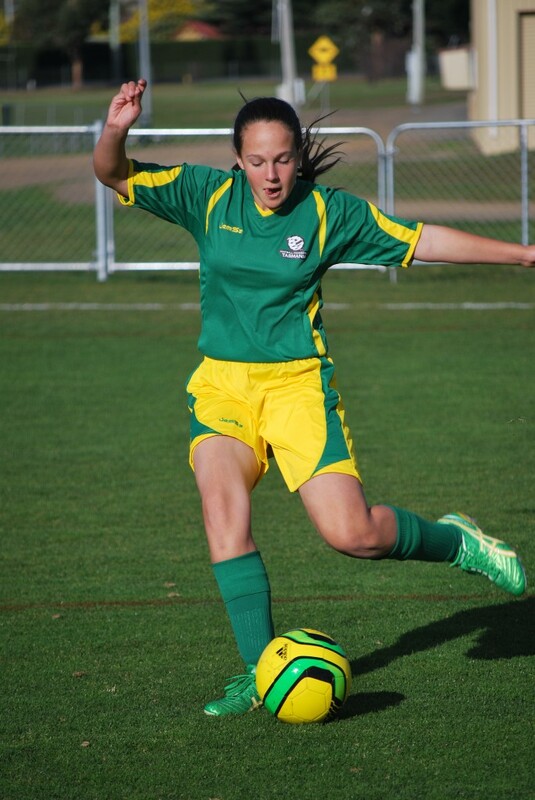 SOPHIE Leszczynski, a resident of Old Beach, recently represented Tasmania at the Football Federation Australia’s (FFA) under 13 girls national football championships in Coffs Harbour. Sophie has been playing soccer since the age of five, starting with Brighton from under 6s through to under 12s, and also captained the Northern Suburbs regional side each year from under 9s. She was selected in the Football Federation Tasmania (FFT) Skills Acquisition Program in November last year, and is currently playing for the FFT Skillerettes team. Sophie is the only member from the Northern Suburbs Region in the team. The Tasmanian team was very successful in Coffs Harbour, finishing with two wins, two draws and only one loss. The girls only conceded four goals throughout the tournament. “It is a great honour to represent your State, an achievement that I am very proud of,” Sophie said. “One day I hope to go one better and play for the Matildas”. Sophie thanked Brighton Council for sponsoring her trip to Coff’s Harbour to attend the FFA National Youth Championships. BRIGHTON Council has welcomed the major investment by Toll Tasmania in its new transport and freight facility at the Brighton Transport Hub. Toll’s new $24-million headquarters were officially opened by Premier Will Hodgman and consolidates the company’s southern Tasmanian operations. 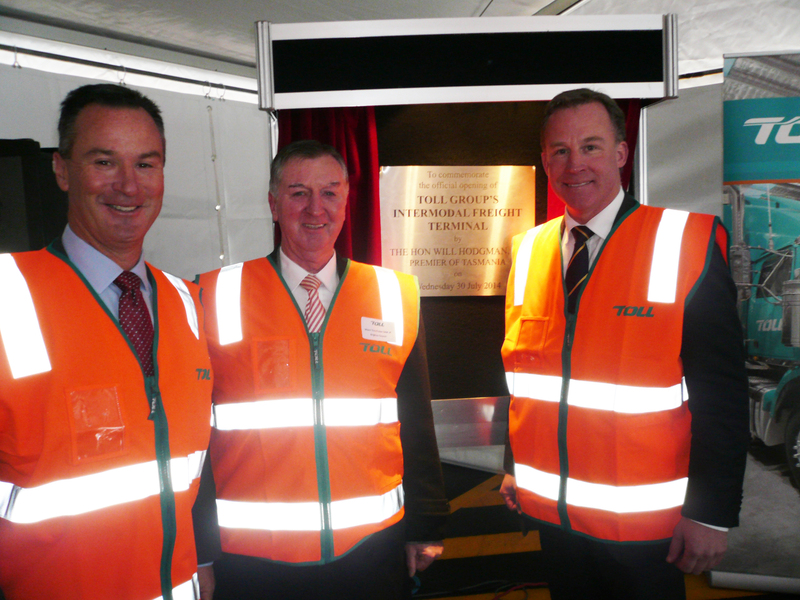 Toll Group managing director Brian Kruger, left and Premier of Tasmania Will Hodgman, with Brighton Mayor Foster. The 17,000 square metre transport facility, covering 6.8 hectares, will handle general and refrigerated freight, warehousing and distribution services and container storage for domestic and international shipping. It follows TasRail’s relocation to the Transport Hub in 2013. In his speech to open the complex, the Premier congratulated Brighton Mayor Tony Foster who he said was the extremely proud father of a very big baby. Mayor Foster said the opening of the Toll facility represented a significant economic development for Brighton and an indication of great confidence in the municipality. “Council has worked long and hard for this development and we are extremely pleased to welcome Toll to Brighton,” Cr Foster said. “Toll only commenced site work on the project in July 2013 and it is opened and doing business a little over one-year later. “The company is Tasmania’s biggest freight carrier and this multi-million investment is also strong sign of confidence in our state’s future. “The project has already create jobs through the construction phase and having a more efficient transport system creates opportunities and jobs across the economy. “At the same time, it is a very important development for our community. It will help stimulate our local economy with employees gradually moving in to the municipality to be nearer their employer, as well providing employment for local people in our community. “Being close to the Transport Hub will also be a significant strategic and economic advantage to many businesses and industries in southern Tasmania through efficiencies gained by the Hub’s proximity. “Brighton is also proud of the growth of the Transport Hub which will significantly reduce travel times between southern Tasmania and the Bell Bay and Burnie ports, and that means lower costs and greater efficiencies for businesses. “Clearly the Toll development bodes very well for the future of the Brighton Industrial Estate, the municipality and the region as a whole,” Cr Foster said. Brighton Council now plans to aggressively promote the Brighton Industrial Estate to encourage more businesses to locate adjacent to the Transport Hub. “Brighton offers considerable advantages for business – available and well-serviced industrial land, a supportive Council, ready access to natural gas and electricity, a nearby workforce and now close proximity to a modern transport and distribution facility. “Brighton is on the cusp of a major development phase and Council will continue its efforts to promote economic growth and provide the best possible opportunities, services and facilities for our community,” Cr Foster said. JUST a few days ago, I was delighted to participate in the official opening of Toll Transport’s new Brighton headquarters marking a major milestone in the establishment of southern Tasmania’s new Transport Hub. This $24-million plus investment in southern freight infrastructure provides a major boost for our Brighton Industrial Estate and underlines the importance of our municipality in Tasmania’s economic growth and development. Toll is Tasmania’s biggest freight carrier and this multi-million investment to move its operations from Macquarie Point in Hobart, is a strong sign of confidence in Brighton and in particular, in our Industrial Estate and the Transport Hub. The official opening of the Toll facility is the realisation of many years of vision, perseverance, hard work by many at Council, and perhaps a little frustration on my part. Brighton has long advocated the establishment of the Industrial Estate and the Transport Hub and many past and present Council officers and indeed Councillors have worked long and hard to see this through. Some 17 years ago, I stood on Dudley Clark’s industrial land with then Premier, Tony Rundle and announced that this would be the site of Brighton’s Transport Hub for southern Tasmania. Seventeen years ago it was visionary and it was perseverance and not a little effort that got us to where we are today. Council’s investment in road infrastructure, water and sewerage works has totalled more than $500,000, a clear indication we are very serious about this being the centre for transport for this part of the State, as well as an indication that we know it will bring significant benefits to Brighton. Some years ago we began an intensive marketing campaign to highlight to prospective businesses the attraction of the Industrial Estate and how convenient the Transport Hub is for their transport needs linking them to the rest of the State. Two of the initial re-locaters to the Industrial Estate were Tasbulk and SRT Logistics and many more business have since joined them. We thank all those businesses for their faith in us, and commitment to our municipality. They all now stand to reap the rewards from their foresight. Toll’s investment is not insignificant. The main building is some 14.6 square metres comprising a warehouse, crossdock, drive-through area and workshop. The development also contains a temperature-controlled store, main office building, truck wash building, dangerous goods store and a pedestrian overpass linking the car park to the warehouse/freight forwarding building. The facility operates 24-hours-a-day, seven-days-a-week and employs 125 staff, which in itself is providing a major boost to our municipality’s economy through employees moving closer to their employer and also providing work for local people. The development has the capacity to accommodate 73 parked trailers and approximately 288 external containers. The enhanced economic activity will, in turn, generate more employment opportunities for the people of our municipality and increased rate revenue that in turn can be used by Council to maintain and improve services throughout Brighton. Importantly, as a result of this development, we will see more freight moving between the north and south of the State via rail, lessening the movement of heavy trucks on the Midland Highway. With Toll now firmly established as the anchor tenant in the Transport Hub, Brighton Council is gearing up to launch the latest phase of our intensive marketing campaign to encourage other businesses to consider re-locating to the Industrial Estate and to make the most of the benefits that this entails. At the same time, we are grateful for Toll’s vote of confidence in our community and we are confident that this will be the latest, but not the last, major economic development initiative for our municipality. BRIGHTON Mayor Tony Foster says assuring the future of the Jordan River Learning Federation’s school farm and the agreement of the Education Minister Jeremy Rockliff to look at the overall education needs of the Brighton Municipality is a great outcome for the community. Brighton is among the fastest growing regions of the State, with perhaps the youngest demographic profile and Mayor Foster said while the future of the farm school was extremely important, so too were the broader education needs of the local community. “We had been seeking to meet with Minister Rockliff since the middle of May to discuss our education needs and while the school farm issue did cause some initial concerns, it brought forward our meeting and enabled us to address some major issues, Mayor Foster said. “I was particularly impressed with the Minister’s willingness to work with us, firstly to secure the future of the school farm and then to look at the wider education requirements of our community. Mayor Foster said he was confident that this could now occur with the Education Minister taking a personal interest and his Department assuming full responsibility for the farm’s operations. “At the meeting, I suggested to the Minister that we rezone the site and undertook to take my idea to Council. While Councillors were unaware of my proposal at the time, they subsequently provided their endorsement and we were able to move forward. “This was a significant outcome, but equally important was the Minister agreeing to work with us to ensure that the children of the Brighton Municipality have the best possible access to education opportunities,” he said. “For example, today, some eight buses a day as well as countless private vehicles, take children to and from Brighton to high schools and colleges outside the municipality. “This and Brighton’s continually growing school population clearly demonstrates that a high school at Brighton is needed and would be viable from a student population perspective. Mayor Foster said providing our children with the best possible education must be the top priority for our community. “If we are ever going to resolve important social issues such as unemployment, family breakdown, substance abuse, anti-social behaviour and the like, the provision of improved educational opportunities is a key. “With Council and the Minister for Education working together, we have the opportunity to make a real difference in Brighton,” he said. THE future of the Jordan River Learning Federation school farm is now assured following an agreement reached between the Brighton Council and State Education Minister Jeremy Rockliff. The agreement came after the Council withdrew the notification to the Education Department to remove the animals from the school farm in the centre of the Brighton township. The notification had been issued in compliance with local government by-laws following complaints regarding public health issues at the farm. 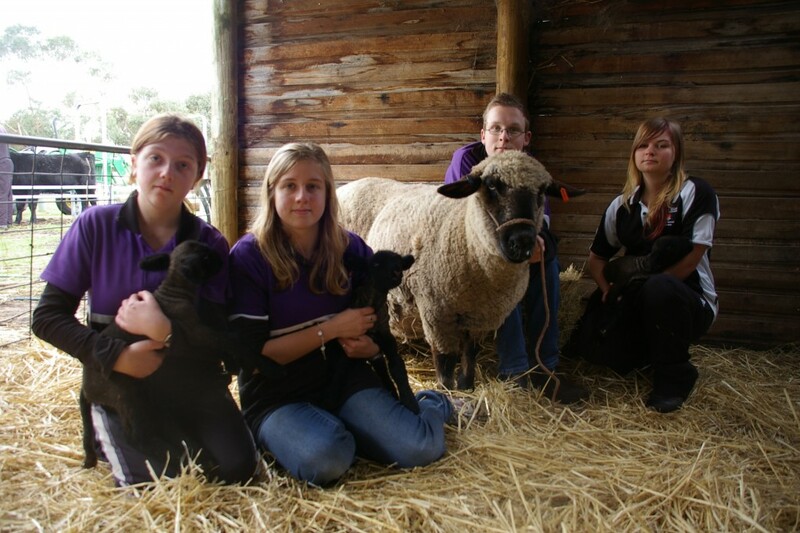 Students enjoy all the Jordan River Learning Federation school farm has to offer. Aware of the important community role played by the school farm, Mayor Tony Foster and Council General Manager Ron Sanderson met with the Minister to develop a unique solution. As a result Brighton Council has moved to have the school farm site re-zoned as a special zone, enabling it to operate with certainty into the future. The Minister has agreed that the Education Department will assume full responsibility for the farm’s ongoing operations. Council unanimously agreed to ask the Tasmanian Planning Commission to make the farm school site a ‘particular purpose’ zone, which will recognise the uniqueness of the school farm, ensure better management of potential environmental health matters and land use conflicts, and enable it to operate unencumbered by local government by-laws and regulations. The Council motion stated: That Council initiates a planning scheme amendment to rezone the school farm site in Brighton from Residential to a Particular Purpose Zone. Mayor Foster said Council planning officers had begun the process of requesting the Tasmanian Planning Commission to approve the special zone. He said it was a great outcome for the farm school and the community, securing the future of the farm on the current site. “It means the farm school can continue on the existing site with the State Government assuming full responsibility for all issues, and the Minister committing to enhance and add to the school’s value and education outcomes. “Our meeting with the Minister was highly productive with Minister Rockliff agreeing to work with us, not only to secure the future of the school farm, but also to look at the broader education needs of the Brighton community. “That is what we have been seeking all along and I am extremely pleased with the Minister’s response. “Brighton Council is a strong supporter of the Jordan River Learning Federation school farm and the benefits it provides for school students and the community. We wanted to ensure it was sustainable, but there were conflicts with local government by-laws and public health considerations. Mayor Foster said he was particularly pleased that Minister Rockliff would consider the future education needs of the Brighton community and he looked forward to working with him to plan and develop the necessary facilities and resources. “Brighton is a rapidly growing region and we not only want to ensure that the farm school is developed to provide an even better learning experience for a wider group of students, but also to address the total education needs of our community. “For example, we want to provide improved education opportunities for our students, so that they can choose to undertake their high school studies here rather than travel to Glenorchy and Hobart, as many of them do today. “We will be meeting again with the Minister in a month or so and Council is determined to continue to progress this to achieve the best possible education outcomes for our community. “But we have now resolved the school farm issue and that is welcomed by the Brighton Council and welcome news for the Brighton community,” Mayor Foster said. • One of the school farm’s ewes with her triplets.